Acetaminophen: Where is it Found? And How to Handle Too Much of It! A 14-year-old girl with a history of suicidal behavior presents to a pediatric emergency department with polysubstance ingestion. Over the last two days she has ingested variable amounts of lorazepam, alcohol, and DayQuil™ (acetaminophen, dextromethorphan, and phenylephrine). She drank an unknown quantity of DayQuil™ the day prior and admits to drinking an entire bottle on the day of presentation. The patient denies any current symptoms. On examination, she is in no acute distress. Her neurologic examination is non-focal with a Glasgow Coma Scale of 15. Her abdomen is benign. She has linear scars to the left forearm from self-injurious behavior. She is cooperative, nonchalant about her ingestion, describes her mood as “numb”, and has a flat affect. Her laboratory analyses reveal an acetaminophen level of 65 mcg/mL. Liver function tests are unremarkable, INR is 1.0, and ethanol is zero. All other diagnostics are unremarkable. Treatment is initiated, and she is admitted to Pediatrics for acetaminophen overdose. Given that the patient had an elevated acetaminophen level greater than 30 mcg/mL with multiple ingestions over the last 48 hours, she was treated with N-acetylcysteine. Labs were rechecked at 19 hours after initiation of NAC. Liver function tests and INR were stable. Repeat acetaminophen level was < 10 mcg/mL. She was ultimately discharged after Psychiatric evaluation with a home safety plan and outpatient Psychiatry follow up. 1. Blieden M, Paramore LC, Shah D, Ben-Joseph R. A perspective on the epidemiology of acetaminophen exposure and toxicity in the United States. Expert Rev Clin Pharmacol. 2014;7(3):341-348. 2. Myers WC, Otto TA, Harris E, Diaco D, Moreno A. Acetaminophen overdose as a suicidal gesture: a survey of adolescents' knowledge of its potential for toxicity. J Am Acad Child Adolesc Psychiatry. 1992;31(4):686-690. 3. Kanabar DJ. A clinical and safety review of paracetamol and ibuprofen in children. Inflammopharmacology. 2017;25(1):1-9. 4. Lewis RK, Paloucek FP. Assessment and treatment of acetaminophen overdose. Clin Pharm. 1991;10(10):765-774. 5. Sztajnkrycer MJ, Bond GR. Chronic acetaminophen overdosing in children: risk assessment and management. Curr Opin Pediatr. 2001;13(2):177-182. 6. Walls RM, Hockberger RS, Gausche-Hill M. Rosen's emergency medicine : concepts and clinical practice. In: Ninth edition. ed. Philadelphia, PA: Elsevier,; 2018: https://login.revproxy.brown.edu/login?url=https://www.clinicalkey.com/dura/browse/bookChapter/3-s2.0-C20141019850 Full text available from ClinicalKey Flex. 7. Rumack BH, Matthew H. Acetaminophen poisoning and toxicity. Pediatrics. 1975;55(6):871-876. 8. Chiew AL, Gluud C, Brok J, Buckley NA. Interventions for paracetamol (acetaminophen) overdose. Cochrane Database Syst Rev. 2018;2:CD003328. 9. Spiller HA, Krenzelok EP, Grande GA, Safir EF, Diamond JJ. A prospective evaluation of the effect of activated charcoal before oral N-acetylcysteine in acetaminophen overdose. Ann Emerg Med. 1994;23(3):519-523. 10. Bateman DN, Dear JW, Thanacoody HK, et al. Reduction of adverse effects from intravenous acetylcysteine treatment for paracetamol poisoning: a randomised controlled trial. Lancet. 2014;383(9918):697-704. 11. Pizon AF, Jang DH, Wang HE. The in vitro effect of N-acetylcysteine on prothrombin time in plasma samples from healthy subjects. Acad Emerg Med. 2011;18(4):351-354. 12. Prescott LF, Park J, Ballantyne A, Adriaenssens P, Proudfoot AT. Treatment of paracetamol (acetaminophen) poisoning with N-acetylcysteine. Lancet. 1977;2(8035):432-434. 13. Yarema MC, Johnson DW, Berlin RJ, et al. Comparison of the 20-hour intravenous and 72-hour oral acetylcysteine protocols for the treatment of acute acetaminophen poisoning. Ann Emerg Med. 2009;54(4):606-614. 14. O'Grady JG, Alexander GJ, Hayllar KM, Williams R. Early indicators of prognosis in fulminant hepatic failure. Gastroenterology. 1989;97(2):439-445. You walk back to triage with the tech to see a 86 year old male patient who looks unwell. Dry mucus membranes, mumbling to himself and not making sense, not responding to your questions, febrile, diaphoretic. You know something is wrong, and a quick review of his nursing home paper work gives you the answer: digoxin toxicity. Figuring out what medication is causing problem for an altered patient can be challenging for any physician. Luckily, there are some classic ECG changes that will help clue to into what a patient may have overdosed on. Beta blockers (such as metoprolol, propranolol, carvedilol) interfere with catecholamine effect on beta adrenergic receptors (principally Beta-1 on heart muscle cells) leading to a decreased heart rate and contractility (Yates & Manini 2012). This leads to low heart rate and blood pressure, as well as an increased probability of sinus bradycardia on ECG. There are a few main-stays of treatment, all of which try to counteract the drugs activity at the cell. High dose insulin therapy (1U/kg/hr) with high dose glucose (0.5g/kg/hr) is thought by some to be first line for beta blocker overdose (Nelson et al. 2016). Hypoglycemia is coming in these patients, so make sure that highly concentrated (≥5% dextrose solutions) glucose is given before the insulin. If this fails to correct the hypotension, beta-selective pressers such as dobutamine and isoproterenol may help, but carry the risk of paroxysmal hypotension due to the high doses that are often required (Nelson et al. 2016). Glucagon is the classic first line treatment for beta blocker overdose, but has high rates of vomiting and requires large doses, so most hospitals will exhaust their supply before the beta blocker has time to wear off (Nelson et al. 2016). Additionally, phosphodiesterase inhibitors (inamrinone, milrinone, enoximone) can help prevent cAMP breakdown and thereby increase calcium activity within the cell to increase frequency and strength of contract (Nelson et al. 2016). Vasopressin (Holger et al. 2007), levosimendan (Archan & Toller 2008), pyruvate (Hermann et al. 2004), and fat emulsion are also possible treatment options, but only have animal trials or case reports to support their use, so it is unclear if these actually work. Calcium channel blockers (such as amlodipine, nifedipine, diltiazem, verapamil) have similar effects to beta blockers (lower heart rate), but calcium channel also usually block sodium channels, causing conduction delays and QRS widening. This key difference may clue you to a calcium channel blocker overdose in a bradycardia patient. Sodium channels are responsible for depolarization of myocytes in the atria and ventricles, so blockade of these channels will lead to prolong depolarization and widen the QRS complex (Nelson et al. 2016). There is also a classic ECG finding of a prominent r-wave and a rightward axis of the terminal deflection of the r-wave that is seen in lead aVR of a 12-lead ECG. This finding is a result of sodium channel blocker’s preference for blocking the right bundle of the bundle of Hiss (Yates & Manini 2012). Drugs that block this channel include lidocaine, procainamide, and flecainide. Overdose treatment for sodium channel blockade may vary slightly depending upon the specific xenobiotic that is causing toxicity. In general, a prolonged QRS from a drug known to cause sodium channel blockade is treated with sodium bicarbonate at a rate of 1-2meq/kg as an initial bolus, followed by a drop of 150 met in 1L D5W at twice maintenance. Keep the ECG attached while doing this so a quick ECG can be done to assess for narrowing of QRS. Any overdose with a QRS longer than 100ms (Nelson et al. 2016) should be treated because of the risk of arrhythmia and death (Boehnert & Lovejoy 1985). Potassium channels mediate cardiac repolarization, so cause lengthening of the QT interval on ECG (Barrett et al. 2016). This QT prolongation is thought to increase the risk of developing a polymorphic wide complex tachycardia known as Torsades de Pointes (Kurita et al. 1992). Many drugs can have this affect, though few use this effect therapeutically. Some examples include anti-nausea medication, anti-psychotic medication, macrolide and fluoroquinolone antibiotics, and antihistamines. The mainstay of treatment for most potassium channel blocker xenobiotic overdoses is observation and symptomatic care. While there are not many specific treatments known for potassium channel blockade, IV magnesium (2mg) is used for treatment of prevention of Torsade’s de Pointes (Brady 2016). Electrical cardioversion and overdrive pacing are also treatment options for unstable patient in Torsades (Brady 2016). Digoxin and other cardiac glycoside plants exert both therapeutic and toxic effects by blocking the action of Na/K/ATPase pump. By increasing the intracellular concentration of calcium, contractions of the heart are stronger and occur at a faster rate (Nelson et al. 2016). All this extra calcium causes makes the gives the heart cells a lower activation energy, and makes they more prone to random contraction. Blocking this pump also causes AV nodal blockade by lowering the gradient for calcium influx and thus AV nodal depolarization. These combined effects lead to the classic ECG findings of digoxin toxicity: increased automaticity with block and rhythms such as bi-directional VT (Nelson et al. 2016), atrial flutter with ventricular bradycardia, and the “scooped out” t-wave (the QRS terminates into a depressed and down-sloping ST segment with a short QT interval) known as Salvador Dali’s mustache (Ma et al. 2001). Treatment includes digoxin-specific antibody fragment (DSFab) (acute toxicity dose = (mg ingested / 0.5mg/vial * 80% bioavailability; chronic toxicity dose = (serum digoxin concentration in ng/L) x (weight in kg) ÷ 100), usually 10-20 vials for acute poison and 3-6 vials for chronic poisoning in adults, 1-2 vials in children). This antidote is effective for cardiac glycosides other than digoxin (such as oleander) (Nelson et al. 2016). Atropine, phenytoin, and lidocaine have also been used, but are often not needed due to DSFab efficacy (Nelson et al. 2016). Table 1: Summary of xenobiotic effects and associated ECG findings. These ECG tracings were use with the permission of Dr. Mike Cadogan, and additional images, summary, and description of ECG changes seen in overdose can be seen on his website www.lifeinthefastlane.com. Archan S, Toller W. “Levosimendan: current status and future prospect.” Current Opinions in Anesthesiology. 21:78-84. 2008. Boehnert MT, Lovejoy FH Jr. “Value of the QRS duration verses the serum drug level in predicting seizures and ventricular arrhythmias after an acute overdose of tricyclic antidepressant.” NEJM. 313:474-479. 1985. Brady WJ, Laughrey TS, Ghaemmaghami CA. Cardiac Rhythm Disturbances. In: Tintinalli JE, Stapczynski J, Ma O, Yealy DM, Meckler GD, Cline DM. eds.Tintinalli’s Emergency Medicine: A Comprehensive Study Guide, 8e. New York, NY: McGraw-Hill; 2016. Graudins, A., Lee, H. M., and Druda, D. (2016) Calcium channel antagonist and beta-blocker overdose: antidotes and adjunct therapies. Br J Clin Pharmacol, 81: 453–461. Hermann HP, Arp J, Pieske B, et. al. “Improved systolic and diastolic myocardial function with intracoronary pyruvate in patients with congestive heart failure.” Cardiovascular Drugs and Therapies. 15:405-411. 2004. Holger JS, Engebreten KM, Fritzlar SJ, Patten LC, Harris CR, Flottemesch TJ. “Insulin vs vasopressin and epinephrine to treat beta-blocker toxicity.” Clinical Toxicology. 45:396-401. 2007. Holstege C, Eldridge D, Rowden A. 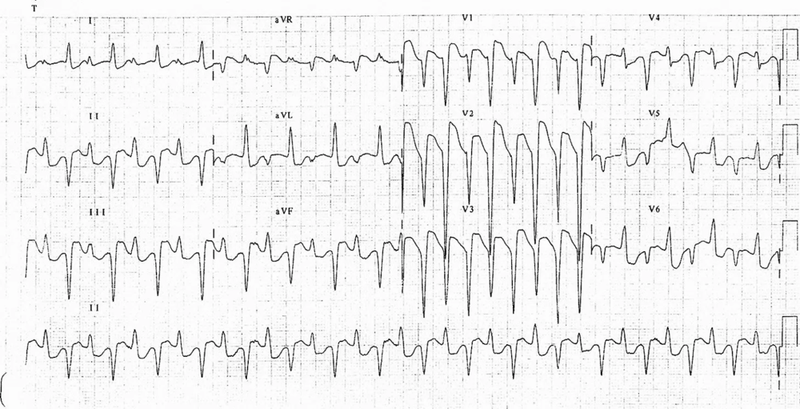 “ECG Manifestations: The Poisoned Patient.” Emergency Medicine Clinics of North America. 24:159-177. 2006. Kurita T, Ohe T, Marui N, Aihara N, et al. “Bradycardia-induced abnormal QT prolongation in patients with complete atrioventricular block with torsades de pointes.” American Journal of Cardiology. 69(6):628-33. 1992. Ma G, Brady W, Pollack M, Chan T. “Electrocardiographic manifestations: Digitalis toxicity.” Journal of Emergency Medicine. 20:145-152. 2001. Nelson L, Lewin N, Howland M, Hoffman R, Goldfrank L, Flomenbaum N. Goldfrank’s Toxicologic Emergencies. 9th Edition. McGraw-Hill Companies Inc. 2011. Reikeras O, Gunnes P, Sorlie D, Ekroth R, Jorde R, Mjos OD. Metabolic effects of high doses of insulin during acute left ventricular failure in dogs. European Heart Journal. 6:451-457. 1985.